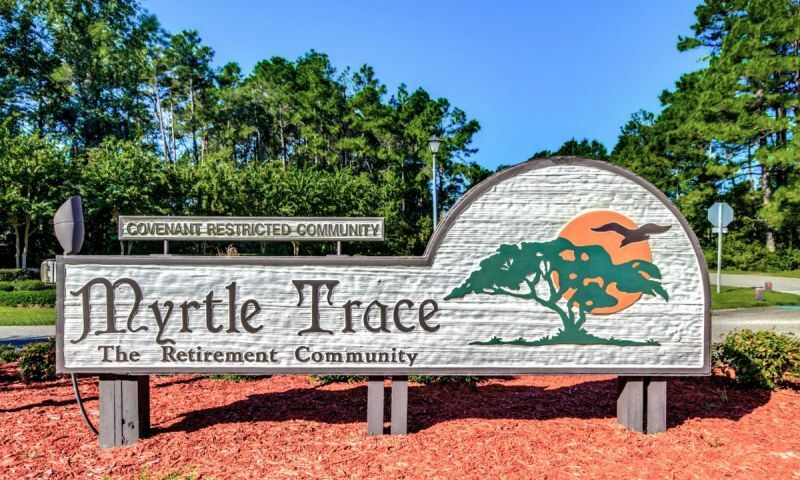 Myrtle Trace is a 55+ community located in Conway, South Carolina. This community boasts a low-maintenance lifestyle with a clubhouse full of amenities. Homebuyers can choose between single-family homes available on a resale basis. Residents of the community enjoy this scenic Myrtle Beach area and all it has to offer. A quaint clubhouse is the focal point for all social and physical activities in Myrtle Trace. Neighbors and friends can gather in the multi-purpose room with a catering kitchen for one of the many holiday or themed parties. The hobby and game room hosts numerous clubs that meet on a regular basis such as book club and game night. Outside the clubhouse the amenities continue with an outdoor pool, bocce ball courts, shuffleboard courts, and horseshoe pits. Built between 1980 and 2005, Myrtle Trace consists of 518 single-family homes available on a resale basis. Homes in the community offer great living options for active adults with ranch-style floor plans and low-maintenance exteriors. Homes in the community range from two to three bedrooms, two to two-and-a-half bathrooms and an attached garage. Most homes back up to wooded areas or ponds with beautiful scenic views. Residents of Myrtle Trace enjoy an active and low-maintenance lifestyle. An annual homeowners' association fee covers general maintenance of the community grounds and amenities. Homeowners enjoy this lifestyle as it gives them more time to enjoy this great community and the surrounding area. Residents enjoy an activities calendar full of things to do such as card clubs, movie nights, bocce tournaments and holiday parties. Myrtle Trace is located in Conway, South Carolina just 30 minutes west of Myrtle Beach. This area offers endless options for entertainment, shopping, and health care. Residents frequently plan day trips to the beautiful coastal beaches to enjoy the sun and water. Golfers love the numerous public and private courses in the area which offers play for all skill levels. Situated close to Highway 701 and 501 travel to other parts of South Carolina is a breeze. With so many choices for entertainment along with a beautiful climate there is no wonder why so many active adults love Myrtle Trace in Conway. There are plenty of activities available in Myrtle Trace. Here is a sample of some of the clubs, activities and classes offered here. Homes in the community offer great living options for active adults with ranch-style floor plans and low-maintenance exteriors. Homes in the community range from two to three bedrooms, two to two-and-a-half bathrooms and an attached garage. Most homes back up to wooded areas or ponds with beautiful scenic views. Please Note: Floor plans are not available at this time. Myrtle Trace offers really nice single family homes from 1000 to 3000 sq. ft. at excellent prices. The neighborhood is bordered by the Burning Ridge Golf Course, small lakes, or wooded areas. The area is full of mature landscaping, the builder built around the trees, very green and beautiful. The amenities include a large clubhouse which has been updated, nice large pool, and Bocci Ball alleys. There are many schedules activities. The neighbors are friendly and caring. The beach and airport are 10 minutes away. I totally recommend this neighborhood. Myrtle Trace is a good place for a nice home that won't break the bank. The homes are priced right and it's a nice, quiet neighborhood. The amenities could use some updates but overall it is nice. I also like that the place is done so there is no loud construction to worry about. The houses are surrounded by lots of old mature trees. 55places.com is not affiliated with the developer(s) or homeowners association of Myrtle Trace. The information you submit is distributed to a 55places.com Partner Agent, who is a licensed real estate agent. The information regarding Myrtle Trace has not been verified or approved by the developer or homeowners association. Please verify all information prior to purchasing. 55places.com is not responsible for any errors regarding the information displayed on this website.